These are the 256 Odù Ifá. The first are the 16 Meji, or Oju Odù. The next 240 Odù Ifá are combinations of the first 16. The Odù Ifá are patterns of binary code, opened and closed nodules, which represent all of the energies contained in Igba Iwa, The Calabash of Existence, or the Universe. These are the universal energies that give birth to all given circumstances and situations, all the blessings and misfortunes of the universe are contained within them. They hold the key to all the blessings and all the misfortunes of life and death. 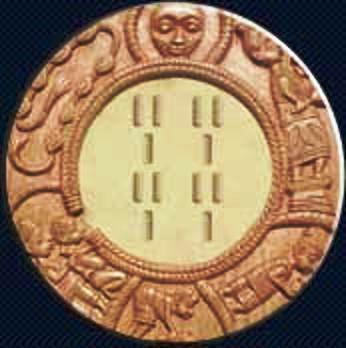 The Odù themselves are the oracles of the Yorùbá divination systems of Ifá, Obi, and Merindinlogun. It is through the knowledge of these energies, called Odù Ifá, that Babalawo and Iyanifa are able to work with individuals to achieve the greatest potential of their destiny. It is through these Odù Ifá that priests and priestesses of Oriṣa can help people to repair their Orí’s and better themselves. The Odù Ifá are like blueprints to all the energies possible in the universe. Each has verses of esoteric knowledge associated with it along with medicines, rituals, and sacrifices that accompany each of the 256 Odù. Included in this listing of the 256 chapters of Odù Ifá are the names and aliases of the Odù as taught in my lineage of Ifá, which is from Oyo State, Nigeria. Please note that the names and fixed esoteric order of the Odù Ifá may differ from lineage to lineage. Thank God, with work like these there is hope that our heritage will not be lost to the western believe and custom. I recently discovered that my Ifa is ogundabede. Pls can u let me no the attributes of ogundabede, the do and don’ts to succedin life, I’ve missed a lot of opportunities in life and time is running against me. I’ll be delighted if u can do this for me. Edumare a gbe wa oo. Ogundabede is odu ifa that works for people who must or is involved in not a legal business. If you have been working in a company you are only wasting your time. Ogundabede was a thief that was successful in his business. On the contrary, OGUNDABEDE is an ODU IFA that requires one to be truthful and upright. It says that through patience and good character, success will be guaranteed. Thanks for the this posting, good to know more about ifa. Can i know more about Oturuponogbe. We thanks God that our fore father’s culture did nt died like that,but pls can u tell me the meaning of oyeku meji. This post is vry interesting. Thanks alot 4 d posting. Please, I want to know if thier are some osole that has no side effects because i was told one has no side effects. Hello can you let me know about this? Please, Can I have any Oshole thats eefective that I can do without any side effect? Please help me as I am running into abject abject poverty. Thanks in advance. Thank you for your comments. Please continue to follow our blog. please is there any odu ifa called OWORIIS KOROSUN? Can you recommend to me a God fearing Ifa Priest (not 419 ones) that can minister with conscience. Your quick response would be appreciated as i have been victims of 419 ifa priests to the extend that i have vouched never to consult ifa again. i love this cultural display and information, please can you send Ifa eulogies (Oriki) to me. Your correction, Oriki is not eulogy. Know the meaning of Eulogy and the meaning of Oriki, then learn their differences there in and you will get your want. Pls I will like to know much about ifa if u can mail me I will be very greatful. Cos I want to know the merit of having my own ifa and bein a member to a temple or being initiated as a member or ROF,ABORIGIN, E T C.
Isese a gbe wa o. Ase! My Odu is Owonrin Otura.Pls can you send me the full oriki? pls is there any odu called owonrinnikin? if yes what is the symbol. I love those oju odu ifa, but how can we download it? What are you looking for download? Pls i want to do ifa consultation. how do i go about it pls? Good work sir Olodumare will continue to bless ur work. I will love to consult ur ifa. Pls let me know how to reach you. Don’t worry I think IFA has already been contaminated like the rest of the major religions. However, the born natIves that still have their heart on the Altar of IFA and the required discipline for the knowledge and wisdom still have it intact unpolluted. To be more is to know more. It’s in reality a nice and useful piece of information. I am satisfied that you shared this useful information with us. Aboru aboye ooo, this is a wonderful job you are doing. Ifa a gbe yin for preserving our culture. Please l need more on odu or ogbe ate (bend). Pls explain d meaning of eji ogbe to me.Thank u for this wonderful work. Aboru boye bosise o, Odua a gbewa o. My initiatic Odu is OGBE-OSE; i’d be grateful if u can post me the do’s and dont’s. If ifa is real to get the truthful one is what is making people running away from it and beside do have idea of a sure person. Are you Shola Williams of Amen House Ibadan? Alaafia. No, I am Fagbemijo Amosun Fakayode, Otun Amufawuni of Ibadan. I am in California, USA. If you have any questions or comments you can always email us at oyekuofun@yahoo.com. Many blessings, IRE O. Good Morning to you all over all the good work of Olodumare you have been doing here Ifa will bless you all Ase. please my Odu Ifa is OBARA–EKA i really want you to tell me same thing about his path way of sucess and what are the tabos in life? I was told by one babalawo that I should do sacrifice of obara Meji,please explain the meaning for me sir. Aboru aboye oo, poderia me informar mais sobre esse Odu IRETE IROSUN?? Aboru aboye oo baba awo, Please help me explain the meaning Iworirete, what are the things I need to avoid as eewo. Aboru aboye oo baba awo, Please help me explain the meaning EJIOGBE, what are the things I need to avoid as eewo. Pls i wnt to know d meaning of Obiri Elegbe. IT IS A GREAT JOB, PLS KEEP IT UP. CAN U HELP WITH IROSUNKA, D PATH WAY TO SUCCESS AND THEIR TABOO TO MY BOX. Dis is a great job, Orunmila wll stand by u in all ur effort in life, my odu ifa is ogbe ate pls sir I wnt u 2 email m in my box the dos nd dont nd d repercussions. isese agbe wa ooo. Sir, I will like to know the odu ifa that brought into this world. I want to take the right direction as ordained by eledumare enlighten me. What are the do’s and dont’s of anyone with odu ifa “Ogunda-Irete” divination to be successful in life. May you help me sir, with the oriki, and all the do’s and don’ts of Ifa OGUNDA – IRETE. Ifa a gbe wa o.
pls l need your help sir ,how can l do sacrifice for ifa oyeku irete,with best some thing to do it and the really meaning. Please can you advise me about ewo and Ebo of Ogbe Otura/ Ogbe Olara? Thanks a great deal for the wonderful work you are doing here. Please, my Odu Ifa is ‘Ogbe Ola’. Please, do help me with other names this Odu is called. Thank you. Aboru boye o.
Aboru boye ooo. please sir me I don’t know anything about my ODU at all. I wish to know which work I can do, do’s and don’t attached. please if there is any information you need from me email me and I will send at once. E ni see ti ooo, l’ase Eedua. I need more explanation on ifa ejiogbe. eniti won ba da ifa who ejiogbe fun. E be no tu more. tabi obara meji to owe wa we Iketa. IFA ORI MI RE O! Aboruboye o. please l want to know the oriki OKANRAN OSA…and the ewoo taboo. l really enjoy your job.May God reward you fully. I am also okaran osa..
Aboru aboye o Help my life please I don’t understand how things are going I’m confused. You are great,yoruba are the first before olodumare at of all.pls let me know what to do,when we have Oyeku osa.(solution). Preciso saber algo sobre oyeku osa?? Eku ise ribi ribi. Ifa eji ogbe Ni won da fun mi. Ejowo bawo kin se maa rin ti afi bosi irorun. Well done, really love this site. I would love to know more about odu ifa Ose tura and its taboos. Aburu ‘boye o, I’m stunned to stumbled across a site as this. It gives me great joy that my inherited religion has moved this far. I should be glad to know how I may be of assistance to this cause and its further propagation. Well done. Ifa a gbe we o. Ase. Aboru Aboye Abosise. Thank you for finding and enjoying our site. Please follow us for future posts. Aboru boye ooo, Ifa a bge wa o, (Asee). I real love this web site we need more details on the odu’s divination. Asa ati isese o ni parun o, agba o ni tan Lori le o, (awise). I like this post, am from delta state but i have live all my life io lagos. Am begin to be intrested in ifa, pls my qestion is what is the meaning of iwori ayoka in ifa. I don’t have an e.mail right now pls . How do I know my ifa ? Dear sir/ma with deal respect please I wish to know the oriki of Ejiogunda tanks waiting for your lovely reply. I’ll suggest more work on this. It will be fine, explanatory and appreciative, if the 256 Odus could be explained. I understand what this might gulp from you, but it will save many questions. Like explaining Ejiogbe, Osa Meji etc then OgbeSa, Oyekusa etc till you cover the whole 256. It would be linked to this very post, I mean, having the above listed Odus hyperlinked to their respective posts. In erindinlogin, OBARA OSE…OBARASE. Says,. obara dase nu o gbebga aje kari, obara Omo asisela Omo atoko wageshin, ise tin seni loni ki se ise asegbe, iya tin jeni loni ki se iya aje rorun, adifa fun eni to funni lagbondo oni bara ola bara, eiye bara ki Kate. email me for more info. Do we have the articles of these Odu Ifa anywhere on the internet? I want to download them. Sir. with due respect please can i lean Ifa online? Ogbo Oto Sir,i Want To More About Osole Sir & Does He Have Side Effect.I Need Good Priest That Can Check My Life To Better. Sir, Kindly give me the meaning of this odu ifa….’ogbe irikusa’. Also what is the implication of throwing away one’s ifa and what is the way out to rectify it? Ase o to all my brothers Iboru Ibolla Ibocheche. Can anybody please tells me more about the odu ifa of ( irete osa ) and the taboo, as in the “” do and undo”” ifa a gbewa ooo. what is the odu meaning of irosun okanran? Please sir I really appreciate your kind of gesture to people and your hand work.. You really make people understand that our culture and traditions is still very important.. And I really agree with you without No doubt… KININI ORIKI IFA OSE ITURA ATI AWON EWO RE..
BIDO IFA OSE ITURA ATI ORIKI. PELU EWO RE..
my Odu Ifa is Otura OSa (Otura ma sa), please i need d explanation about this Odu Ifa and what are the dos and dont of the Odu Ifa. Who am i according to d Odu Ifa. Pls sir, i need Oriki,and itumo ifa ODI OFUN. Thsnks sir.